A photo of a cat struck with an arrow appeared on social media Tuesday. As a result, the owner had to put the animal to sleep. 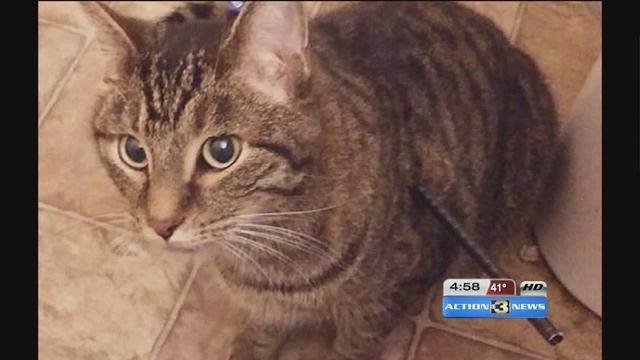 Now the search is on for a cruel criminal who shot the feline ultimately killing the cat. The owner says Pocket was a best friend to the entire family. He’s been with them since he was a kitten, and she's still trying to understand why someone would target a cat. "Boredom, fun practice," said Jenni Barney. Those are just a few reasons Barney could come up with as to why someone would hurt her cat. "There were quite a few people like it's just a cat, not a child you guys need to get a life, and that was hurtful because he was a child to me," Barney said. Barney says Pocket has been in the family for six years, but Sunday she saw something she says she could have never imagined. "When I went down there and saw him, he had an arrow stuck through him and I was freaking out," Barney said. Barney says she believes her cat was shot by someone in the neighborhood. "He never bit anyone, he never clawed anyone," Barney said. Pocket was put down due to the arrow piercing through vital organs. Now all she's left with is pictures and questions for the shooter. “Just want know why, why would you take a pet from me?” Barney said. “What was going through your head when you shot him, and why would you even do that to an animal?” Barney continued. Despite a few negative comments Barney says her family has also received a lot of support from strangers and people on Facebook.